Sara Saljoughi <sara.saljoughi@utoronto.ca> is Assistant Professor of English and Cinema Studies. She has published articles in Iranian Studies, Camera Obscura, Feminist Media Histories, Film International, and Jadaliyya. Her current book project, Burning Visions: The Counter-Cinema of the Iranian New Wave, examines the aesthetics and politics of art cinema in Iran during the 1960s and 1970s. She is the co-editor of 1968 and Global Cinema (Wayne State University Press, 2018). The study of Iranian cinema has blossomed over the past two decades. Where it was once dominated by the study of auteur cinema made in the context of the new film industry of the Islamic Republic of Iran, it now spans the history of the moving image in Iran. New studies push forward earlier understandings of the field by introducing new periodization, critical genres, and new methods of reading and interpretation. Alongside the expansion of topics and approaches is a breadth in disciplinary methodologies. Current research in Iranian cinema is informed by fields as diverse as Middle Eastern studies, film studies, comparative literature, history, and anthropology, to name a few. It is now crucial to signal this shift away from earlier studies that tended to focus on the social and political dimensions of cinema, at the cost of examining other equally important aspects of film. Insofar as fields of study form by first offering an account of objects, it is especially important to chart how the field has changed and, more specifically, the ways it has opened up and expanded. Alongside that opening must necessarily come some questioning of the object itself. While it is certainly useful to ask “what is Iranian cinema?” we might also want to ask how we have told the stories of Iranian cinema and how we might alter and change those stories as we begin to utilize new interdisciplinary paradigms. The present essay takes this opening of the field as the occasion to propose ten theses on Iranian cinema that open possibilities for rethinking the field as well as key moments in its history. The title of the essay is a nod to Abbas Kiarostami’s Dah/Ten (2003), a text that represents dynamic shifts, both in the work of the filmmaker and in the broader Iranian cinematic landscape. In attempting to attach ten theses to Iranian film history, the essay borrows the experimental, fragmented structure of Ten in order to imagine a new synchronic history. Iranian cinema has always been attentive to the politics of looking. From its earliest years of production, Iranian cinema has concerned itself with the politics of looking. While an engagement with the politics of looking might be inherent to the moving image itself, investigations into contemporary Iranian cinema overwhelmingly suggest that attention to the look is the province of post-revolutionary film culture and its focus on an Islamic cinema. Doubtless, this emphasis is part of an overall tendency to equate the new film culture post-1979 as representing a radical departure from previous film practices. This is certainly true in terms of the guidelines on screen representations of women and of heterosexual relations. But beyond this, there are questions of aesthetics and politics that persist throughout the history of Iranian cinema. One of these is the question of fascination with the image and how that fascination prompts us to look in particular ways—at each other, the world, and ourselves. Haji Agha, Aktor-e Sinama/Haji Agha, the Cinema Actor (1933, dir. Ovanes Ohanians) one of the earliest feature length films made in Iran, explores this fascination with the image in the context of skepticism of the new technology of the film camera. In particular, the film asks us to consider how propriety is implied and/or challenged by the looks the cinema engenders. The question seems urgent because the moving image differs in significant ways from the images that had circulated in Iranian culture prior to this moment. It was not just the images that differed but the manner in which they were exhibited and seen. Haji Agha, the second feature by Ohanians—who is also credited with the first Iranian feature film Abi and Rabi (1930), can be read as a critique of a reactionary society that wishes to modernize but is deeply suspicious of the changes that come with modernization, such as new technologies. Ohanians acts in the film as a director looking for a subject for his film. He lands on the titular Haji Agha, a rich conservative with community importance. Haji Agha’s daughter and son-in-law conspire with the director to capture Haji unawares. In an exaggerated manner, when Haji Agha sees his own image in the finished film, he is captivated by it, forgetting the suspicion he previously held. Seeing himself reflected on screen completely transforms his position on the cinema, which he comically comes to appreciate. The politics of looking as presented in the film can be read as an allegory for the push-and-pull effect of modernization; on the one hand, it is seen as the road to the dilution of so-called tradition values (that might try to restrict certain looks), while on the other hand it offers a seductively new way of understanding the world around us. The fascination with the image, as it is explored in Haji Agha, opens out in later Iranian cinema as a potential of the frame. The film shows us, through Haji Agha’s altered stance on cinema—indeed, his transformation—the possibilities of the frame as a device for shaping our vision of the world. Nowhere is this explored more explicitly than in Kiarostami’s cinema. The windows and cars that abound in Kiarostami’s films are suggestive of multiple ways to frame vision, even within a single shot. Kiarostami often have us think about looking by framing and reframing, but also by playing with light to introduce new types of images. In 2010’s Copie conforme/Certified Copy, we see Elle (Juliette Binoche) and James (William Shimell) through the windshield of a car, which reflects buildings and cobblestones that lie in the road ahead. We also see straight through the car and out the rear window, seeing what they have passed and what Elle, the driver, might see in her rearview mirror. Throughout the film, Kiarostami plays with these multiple viewpoints, suggesting different possibilities for looking. One of the implications of this long history of interest in looking is that the modesty guidelines imposed on Iranian cinema after the establishment of the Islamic Republic of Iran are not novel in their attempts to write overlooking as a troubled and troubling act. Throughout the history of Iranian cinema, filmmakers have used various types of looks to trouble any notion of straightforward visuality and looking relations. Sabzian, the cinephile star of Abbas Kiarostami’s Nema-ye Nazdik/Close-Up (1990) states, quite baldly, “I am interested in cinema.” This declaration is more than the admission of a hobby or interest; it is the crux of the man’s journey of self-transformation. Hossein Sabzian infamously impersonates Mohsen Makhmalbaf to an impressed and impressionable Tehran family, thereby gaining access to their home, lives, and eventually, financial support. Close-Up is one of Kiarostami’s most revered films for the manner in which it restages the real-life events of the Sabzian case with the social actors playing themselves. The reenactment allows for reflection on what occurred and its repetition in front of Kiarostami’s camera. Through the reenactment, the depth of Sabzian’s desire to become Makhmalbaf compels viewers to contemplate this very bewildering form of cinematic embodiment. In stating his interest in cinema, Sabzian symbolizes something much larger than the scope of the film. It is a statement that calls forth a radical subjectivity, which mirrors the transformative moment in Iranian cinema within which the film takes place. To speak of his interest in cinema, Sabzian described an inclination toward cinema. It is a statement of cinephilia, but one so deep that it performs the work of transforming the subject into cinema itself. It is as though Sabzian is stating he is the cinema. The statement is reflective of the official status of cinema post-revolution. If Sabzian is the cinema, then it bears asking what we know of Sabzian and what that might tell us about cinema. He is a pious, working class man struggling to survive. He belongs to the segment of Iranian society that the nation-state (following the establishment of the Islamic Republic of Iran) projects. He then must also be implicated in the state’s opposition to cinema as a technology of imperialism. Sabzian embodies the cinema by becoming what he knows of it—seemingly a sole film by Mohsen Makhmalbaf, The Cyclist (1987). He is thus a condition of possibility for the rebirth of Iranian cinema for his very existence implies that watching film is a transformative experience. The regime too, as Negar Mottahedeh has argued, imagines a heterosexual male as its ideal spectator, for the manner in which screen codes are oriented always toward that subject’s projected desire. The notion of becoming and transforming though the act of spectatorship is one implicit in the very position the state took toward cinema after 1979. This is the case both in terms of restrictions and guidelines, as well as in Khomeini’s famous vote of confidence for the productive possibilities of revolutionary cinema. Sabzian’s transformation into Makhmalbaf, even if dubiously intended, suggests that cinema holds possible an endless variety of such transformations. The relationship between cinema and subjectivity then opens out onto different configurations, which may or may not align with the project of the nation-state. In other words, the state may wish to engender a particular type of citizen at various points in history but this may or may not “work” in the spectatorial experience. Iranian cinema is in intimate dialogue with other Iranian arts. Through its engagement with a variety of Iranian arts, such as poetry, painting, and drama, Iranian cinema is in a constant state of questioning about cinema’s relation to these arts and its pivotal position in national culture. “Cinema is not cinema as we know it.” This could be the message of Shirin (2008), one of Kiarostami’s more experimental films. One of the film’s central concerns is the nature of cinema, how viewers understand the medium, and what process best enables thinking through these questions. The viewer of Shirin watches a number of women—all well- known actresses—watching a film at the cinema. The film they are watching is an adaptation of the twelfth-century epic poem, “Khosrow and Shirin.” Kiarostami’s spectator is never permitted to watch the film-within-the-film, seeing only the faces of the women as they watch and react to the events on the screen. The film attempts to make an ontological statement about cinema by breaking image from sound. It also robs us of the point-of-view of the women who watch the film, as we never see a reverse shot from their perspective. These challenges to our understanding of film language break open what we consider cinema—that composite whose elements are often seamlessly combined. The story of Khosrow and Shirin becomes as important as Kiarostami’s film because it is the sonic accompaniment to our observation of the women spectators. This is a novel take on adaptation better described as a kind of marriage. Here we have the persistence of the old, through the re-imagining of such an important cultural text. Through this juxtaposition, we are invited to re-think cinema and also to re-imagine the ways in which cinema and other Iranian cultural traditions relate to one another. In this, the gambit of Shirin shares much with the contrapuntal stance of Sabzian. It is the proximity of cinema to other arts, the intimacy of the moment of suture for the spectator (regardless of the ideological outcome) that makes cinema such a vital part of the politics of Iranian culture. The relationship of cinema to Iranian literature is a long one. As Hamid Naficy discusses, there has been a long history of stories and poems from Iranian mythology and folklore adapted for the screen, as well adaptations of contemporary Iranian literature in the mid-twentieth century. During the heyday of the Iranian New Wave in the 1960s and 1970s, dissident literature by writers such as Gholamhossein Sa’edi and Houshang Golshiri were adapted into relatively successful screenplays for films that were understood to be critiquing the regime of Mohammed Reza Shah. Through this intimate relationship, cinema gained a degree of gravitas as a serious art form through its encounter with literature and poetry. This collaboration between cinema and other forms is evident not only in terms of literature providing the narrative content of films but also in terms of the aesthetics of various forms. The very notion of a poetic cinema (most often ascribed to documentary in the Iranian context) owes much to the historical encounter between cinema and poetry. Poet Forough Farrokhzad’s film editing, which begins with Golestan’s A Fire but comes into full fruition in her film, Khaneh siah ast/The House is Black (1962), put forward a groundbreaking collaboration between the two forms. The rhythm of Farrokhzad’s poetic language fuels her experiments with montage, while the worldview of the film provides an intertextual link to the social consciousness of her poetry. The sensibility of this encounter between poetry and cinema can be traced in Iranian art cinema over the last half century. If we consider Iranian cinema to have always been in collaboration (rather than only “dialogue”) with other Iranian arts, then we have opportunity to imagine anew the emergence of cinema in Iran. One of the dominant theses regarding cinema in Iran posits that we can consider the form as co-emerging with modernity. While there is certainly much to suggest this historically, the relationship of cinema to Iranian art provides a model for thinking cinema beyond the model of an imported Western technology. To conceptualize the development of Iranian cinema in a local and national context allows us to see the ways in which the status of cinema can be understood differently in different historical situations. Future work that expands existing insights into the relationship between Iranian arts such as pardekhani and cinema could help develop knowledge in this area. Iranian art cinema pays homage to the Persian miniature. If Iranian cinema is intimately involved with earlier Iranian art forms, then the tradition of miniature painting is its most forceful example. The miniature has been described as “using a continuous space that infers a single temporal moment”—monoscenic, while at the same time representing multiple perspectives. Multiple perspectives are particularly important to what David J. Roxburgh calls the visual logic of the paintings, for they “do not control the viewer’s bodily relationship to surface.” As we look at a miniature painting, its compositional structure frees the viewer’s head and eyes to roam over the entire painting, moving in multiple directions. For Roxburgh, this opens up interpretational possibilities that supplant the temporality of the image. This feature of the composition is striking for its compatibility with the temporal slowness of Iranian art cinema. There is a mutual relation of intermediality that is afforded and aided by this compatibility. The temporality of a film like Zir-e darakhtan zeitoun/Through the Olive Trees (Kiarostami, 1994) and its final scene, where the lovers weave through the trees and out into a clear field as we watch from an extreme long shot, brings to life the compositional possibilities of the miniature in its collision with cinema. Filmmakers such as Marva Nabili, director of Khak-e sar be morh/The Sealed Soil (1977), have noted the influence of miniature painting on the mise-en-scène of their films. This influence can take shape in several ways. We have, on the one hand, a mimicry of composition. In Nabili’s film this is expressed by way of the isolation of the human figure within a natural landscape. On the other hand, we also see in Iranian cinema a propensity to emulate the loose interpretative framework offered by the miniature form. Miniatures could be interpreted differently depending on the time of reading. They relied upon the person explicating the image and the context within which the explication took place. In this way, we might argue vehemently against the charge of style over substance. This charge has been aimed, quite unsurprisingly given their fame, at directors such as Kiarostami. Indeed, David J. Roxburgh notes that this same charge of superficiality and surface was made against Persian miniature painting, aided by a disciplinary dependence on Western paradigms of analysis. But where one might see a lack of explicit political content—this is despite strategies of distanciation that are quite common in the filmmakers’ work—we might instead consider that lack as an interpretive openness whereby the moving image signifies in a multitude of political ways. This does not suggest that the films are so open that they are meaningless and flat. Rather, those who wish to analyze Iranian art cinema must look for aesthetic strategies such as citations of the miniature in addition to their more common identification of modernist techniques. Iranian cinema must be understood in the disciplinary context of film studies. The interpretation of Iranian cinema reached a new horizon with the publication of Negar Mottahedeh’s Displaced Allegories: Post-Revolutionary Iranian Cinema (Duke University Press, 2008). This groundbreaking book presents a new moment in the study of Iranian cinema by re-reading post-revolutionary art cinema as a women’s cinema. This interpretive gesture aimed to re-think the new guidelines on screen representations of women and of heterosexual, non-familial relations. Importantly, Mottahedeh reads in directors’ interpretations of the guidelines not only the usual workarounds artists must do under censorship, but instead the seizure of an unparalleled creative opportunity. Filmmakers such as Bahrami Beyzai, Mohsen Makhmalbaf, and Abbas Kiarostami, Mottahedeh argues, were creating a new grammar for Iranian cinema, one based in part on the state’s projection of the ideal citizen-spectator. Mottahedeh’s reading of Iranian art cinema in the 1980s and 1990s is facilitated by an engagement with psychoanalytic and semiotic theories of cinema. It is her engagement with 1970s feminist film theory in particular that heralds the book’s new methodology for understanding Iranian film culture. In this way, Mottahedeh’s book represents the beginning of entirely new possibilities for understanding Iranian cinema within the framework of the discipline of film and media studies. The specter of fire haunts Iranian cinema. It is possible to write a history of Iranian cinema as a history of fire. When we invoke fire in relation to Iranian cinema, we think first of the infamous Cinema Rex fire in 1978, an event that is a metonymy of the mainstream reaction to cinema in the lead-up to the 1979 Revolution. The Cinema Rex fire took aim at the trajectory of Iranian cinema, at the audacity of the moving image, and at the spectators who convened for the pleasures of the screen. Its perpetrators remain shrouded in mystery, with various theories as to which faction might have committed the crime. One thing is certain: the fire in Abadan led to many other copycat fires at cinemas across Iran. The year 1978 might be said to present the death of cinema in Iran, and it certainly appeared that way, even if its death was short lived. The metonymic fire flickered years into the post-revolutionary cinematic culture, as a quiet rage that had once stopped cinema in its tracks only to turn around and reignite its very language. Fire functions not only as the engine of death and change in Iranian cinema, but also as potential. It is renewal that persists. And we may think of the qualities of fire, such as burning, as metaphor for the utopian ideals of Iranian cinema prior to the revolution. Elsewhere I discuss the Cinema Rex fires as an eruption of energy and how that energy contained within it not just a reactionary dismissal of cinema, but also visions of how cinema could be used toward social transformation. The repetition of the Cinema Rex story in so many accounts of Iranian cinema demonstrate the perception of fire as renewal in the collective unconscious of those who wish to tell the stories of Iranian cinema. Perhaps the burning oil fields of Ebrahim Golestan’s Yek atash/A Fire (1961) were prescient in more than one way. Golestan is associated with the tradition of poetic documentary in pre-revolutionary Iran and A Fire, which was edited by poet and filmmaker Forough Farrokhzad, sets forth a new film language. The images of the industrial site of the oil fields, the images of workers and the landscape are paired with a poetic voice (Golestan’s own) describing the massive, seemingly unending fire and the efforts to contain it. The spread of the fire strikes us now as metaphor for Golestan and Farrokhzad’s influence on Iranian cinema, much of which bears the imprint of the poetic rhythm of their editing and the non-interventionist attitude to the social world conveyed by the films’ commentary. If the year of cinema burnings in 1978 managed to only briefly terminate the Iranian film industry, the story of the rebirth of Iranian cinema after the revolution is all the more compelling for such a powerful fire ceases only when it is transformed into something else. When we refer to Iranian cinema as a national cinema, we understand Iranian cinema as a distinctly international phenomenon. A familiar way of looking at Iranian cinema has been through the category of national cinema. As Andrew Higson has argued, one of the ways a body of films comes to stand as the “national” cinema of a given nation-state is often through international perception of that nation’s cinema. Moreover, as Higson argues, art cinema often comes to stand in for and define national cinema because it is in most cases the cinema that circulates at international film festivals and the like. This could not be truer in the Iranian context. Think here of the appearance of Abbas Kiarostami on the cover of Cahiers du cinéma, with the question, “Qui-êtes vous M. Kiarostami?” signalling the recognition of Iranian cinema beyond its borders, but even more so, suggesting, with its questions, that recognition by European film circles confers upon non-Western cinemas an arrival of sorts. This notion of art cinema standing in for national cinema raises the question of whether Iranian art cinema is too dominant in terms of the reception and understanding of Iranian cinema more broadly. What makes the films of Kiarostami and other auteurs examples of national cinema? Why not an immensely popular film such as Marmoulak/The Lizard (2004)? The conflict between art and popular cinemas is neither new nor unique to Iran, but it remains important to ask why a supposed “cinema of quality” is considered to speak for the nation. In the context of Iran, it is somewhat troubling that the period of political reform in Iran coincided with international audiences ascribing a relationship of paradox between Iranian cinema and Iran the state. The charming children and bucolic landscapes of Iranian art cinema were interpreted as salves for the more common media images of Iran circulating in the West—threatening and hostile crowds on the other side of a supposed civilizational divide. This type of praise is more than troubling for it posits cultural production as a kind of oasis, while also undermining the manifold nuances of a given film into a mere example of triumph under censorship. It is the work of the international circulation of Iranian art cinema that write that cinema back into the nation’s “national” cinema. To call Iranian cinema an international phenomenon does not undo its “Iranian-ness,” but rather ascribes to this vast body of films a quality of mutability not dissimilar from the transformative effects of watching a film. The act of traveling, bringing with it encounters that inevitably change the traveler (whether human or here, an art object) can also function as bringing to the fore qualities that are less visible when rooted. When we discuss the politics of reading in the Anglo-American academy, we often interrogate the practices of reading non-Western art as an act rife with assumptions about the object in question. In particular, it is the tendency to allegorize non-Western art as always nationally oriented that collapses the particularities of the work. But if we consider that strange object—the Iranian film abroad—as a thing quite distinctly its own and therefore only representative of “national cinema” in that context, we can begin to clarify the different ways in which the “national” in national cinema comes into being. The stakes of this letting go are a more productive mode of inquiry that might allow us to see the ways in which Iranian films themselves are persistent in their interrogation of the national. Indeed, “which Iran?” as the protagonist of Ferydoun Rahnema’s Pesar-e Iran az Madarash Bikhabar Ast/The Son of Iran Has No News from His Mother (1976) asks. Iranian cinema, as a field of study, is in the midst of a significant transformation. How do we understand and write the history of Iranian cinema? 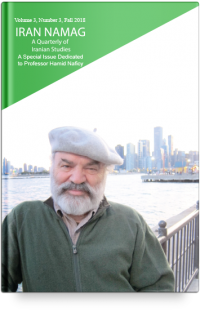 The publication of Hamid Naficy’s four-volume opus, A Social History of Iranian Cinema (Duke University Press, 2011-12) represents a major turning point in the field. Until Naficy’s book, there had been virtually no account, in English, that covered the breadth and longevity of Iranian cinema. Beginning with the dawn of cinema in Iran and taking the reader through to the contemporary moment, with all its transnationalism and box office successes, Naficy’s history of Iranian cinema is a robust treatise on the diversity of what we call “Iranian cinema.” Discussing everything from artists’ film to queer cinema and diasporic film, the books present numerous new areas for research. These areas would undoubtedly bring with them new research methodologies. Where the study of Iranian cinema was once rather limited to studying the effects of the revolution on film and visual culture, a more expansive understanding of film cultures in Iran and the Iranian diaspora allow for a more multifaceted understanding of cinema. Studies of cinema after 1979 focused rather significantly on auteur­-based studies or works that emphasized the social dimensions of cinema. Newer works, such as Blake Atwood’s Reform Cinema in Iran: Film and Political Change in the Islamic Republic (Columbia University Press, 2016) put forward new critical genres. Atwood argues that to simply label Iranian cinema after 1979 “post-revolutionary” is to gloss over the significant differences between revolutionary cinema (that which came with regime change in the immediate years after the revolution) and reform cinema, which was closely aligned with the politics of the reform movement and former President Mohammad Khatami. Atwood reads the relationship between cinema and politics as mutually determining, which marks a departure from the way this relationship has been understood in the field. New concepts require new methodologies and here Atwood’s book is also illustrative of the changes underway in the field. In Reform Cinema, the political dimensions of cinema are considered in tandem with an analysis of the aesthetics and formal strategies of films. What these new approaches to studying Iranian cinema demonstrate is that the field is opening up and in that opening, reveals itself to be capacious for different modes of reading. The opening of the field to accommodate new approaches also operates at the level of individual films, which can only deepen in significant when understood through different approaches at various points in the history of the field. This is not a thesis on Iranian cinema. Jafar Panahi’s In Film Nist/This is Not a Film (2011) made under house arrest after he was sentenced to time in prison and a twenty-year ban on filmmaking, raises significant questions about the conditions of film production in Iran. The film cheekily claims it is “not a film” in order to bypass the restrictions on Panahi’s activities. But it is also not a film insofar as the activity of making it frustrates Panahi’s expectations of what a film ought to be. In a crucial scene, Panahi and his co-director Mojtaba Mirtahmasb sit on the floor of his living sketching an outline of frame composition in a scene, and Panahi writes off his “film” as not at all a film for its lack of story or plot. Blake Atwood discusses the manner in which This is Not a Film uses the question of medium specificity to investigate who has the right to tell stories and how they are told. This is not a thesis on Iranian cinema. To have a thesis on “Iranian cinema” would be to work against what I have described here as its mutability, its volatility, and its openness to transformation. The act of watching Panahi’s film makes us ask, if I am watching it, is it a film (even if the director claims it is not)? And so we might ask, in our attempt to theorize Iranian cinema, what is Iranian cinema? Who decides that its history can be chronicled, or that its objects are known and therefore closed to interpretation? Who decides its parameters? To avoid a definitive answer would allow the thing itself—the object—to escape our grasp, and it is precisely what might allow us to think with these films and non-films. Why write ten theses on Iranian cinema? I have proposed ten arguments for thinking Iranian cinema, which range from an analysis of the aesthetics of Iranian cinema, its relationship to other arts, and ways of understanding the changing field of Iranian cinema studies. What repeats in these theses is the mutual existence of historical discontinuity and, what remains a steadfast feature of Iranian cinema—its ability to engage in transformation. This transformation, whether in the spectator-screen relation, or as a way of understanding the object as it circulates globally, belies the determined nature of a project of “ten theses.” Not only do multiple theses suggest the impossibility of one, but they also represent a desire to resist a grand narrative that collapses the particularities of aesthetics and politics in Iranian cinema. Negar Mottahedeh, Displaced Allegories: Post-Revolutionary Iranian Cinema (Durham: Duke University Press, 2008). Hamid Naficy, “Iranian Writers, Iranian Cinema, and the Case of ‘Dash Akol,’” Iranian Studies 18.2, no. 4 (1985): 231-251. For a more detailed discussion of this relationship, see Sara Saljoughi, “A New Form for a New People: Forough Farrokhzad’s The House is Black,” Camera Obscura Feminism, Culture, and Media Studies 94, vol. 32, no. 1 (April 2017): 1-31. See Hamid Naficy, A Social History of Iranian Cinema, Volumes 1-4 (Durham: Duke University Press), 2011-2012 and Hamid Dabashi, Close Up: Iranian Cinema Past, Present, and Future (London: Verso, 2000). For a discussion of distinctly local cinematic practices, see Shahab Esfandiary, Iranian Cinema and Globalization: National, Transnational, and Islamic Dimensions (London: Intellect, 2012). David J. Roxburgh, “Micrographia: Toward a Visual Logic of Persianate Painting,” RES: Anthropology and Aesthetics 43 (Spring 2003): 12-30: 23. See Christiane Gruber, “Questioning the ‘Classical’ in Persian Painting: Models and Problems of Definition,” Journal of Art Historiography 6 (2012): 1-25. I explore this concept in my manuscript on the aesthetics and politics of cinema in Iran during the 1960s and 1970s, provisionally titled Burning Visions: The Counter-Cinema of the Iranian New Wave. Andrew Higson, “The Concept of National Cinema.” Screen 30, no. 4 (1989): 36-47. “Qui-êtes vous Monsieur Kiarostami?” Cahiers du cinéma (July 1995). This tendency is encapsulated by the response to Fredric Jameson’s, “Third World Literature in the Era of Multinational Capitalism,” Social Text 15 (1986): 65-88. See also Aijaz Ahmad, “Jameson’s Rhetoric of Otherness and the ‘National Allegory,’” Social Text 17 (1987): 3-25. Blake Atwood, Reform Cinema in Iran: Film and Political Change in the Islamic Republic (New York: Columbia University Press, 2016), 14.